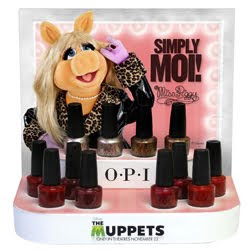 To celebrate the release of the Muppets Movie on 10th February 2012, Disney have launched a Muppets-inspired beauty and fashion range in collaboration with Giles Deacon, O.P.I and M.A.C. Cosmetics. Giles Deacon has created an exclusive dress for Miss Piggy to wear to the Muppets Movie premiere in London on 26th January which is decorated with Swarovski Elements and made from silver leather. The Miss Piggy MAC Cosmetics range will be priced from £9 to £23 and the OPI Miss Piggy Holiday Collection, which looks less tacky with a surprisingly sophisticated colour range, will be priced at £5.48 each. Will you be going mad over the Muppets Movie?